Well, take a deep breathe. Not everything needs to be done at once! 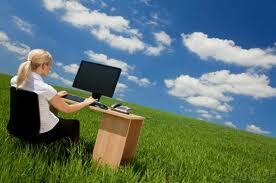 There are small steps that you are already taking, recycling your paper and any plastic or aluminum in your office. Encouraging reusable coffee cups and water bottles, watching your energy use when the building is empty, even watering the lawn less. But there are more steps that you can take to making an earth responsible office! Start with the basics: Have you air filters changed out every year, have the system maintained so that it operates to the best capacity it can. If the system is getting older, and causing problems, talk to you local energy company about replacing it. Look for the EnergyStar labels on your new products, as they have been certified by an energy rated company to be more efficient! Recycling programs are often only a smaller part of a broader workplace program to encourage sustainable business practices. Especially if you're looking to save on costs, combining your recycling program with an effort to reduce office waste and reuse existing products can be a smart business strategy. When you're auditing what goes into the garbage, you might realize that you're wasting a lot of paper. Try to find tasks that could be paperless, or products that could be reused. Recycle your computers, coffee cups, garbage bags, paper towels. Recycling, reducing, and reusing doesn't have to stop in the workplace. Goldman reached out to his community by organizing biannual electronics recycling days in a program called Bethesda Green. "Adding an extra dimension to the program definitely increases the overall awareness," Goldman says. 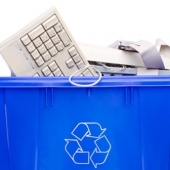 How to Implement an Office Recycling Program: Start with making sure that all your approvals for town, county, and building requirements are in place. Be sure to discuss financial benefits, and contracts for dealing with paper and other recycled waste. Be sure there is budgeted monies to purchase bins and equipment, and that the maintenance staff understands their new responsibilities! Consider composting some of your paper, cardboard and food products! Find a champion who will track and prepare an audit of the saving and amount of waste that is being recycled! Most importantly, make sure all employees understand the new policy, publicize and make it easy for them!!! How about electric? Have you checked your bulbs in all your light fixtures? Fluorescents are more energy efficient but make sure that you are buying bulbs, or as we in the industry say “lamps”, that are closer to Daylight in Kelvin temperature than too cool or too warm. Have you ever noticed that the lamps in the lights are different colors? That is from not purchasing the same Kelvin temperature lamps. Having a Kelvin temperature closer to daylight, or warm white, is easier on the eyes, closer to natural color for the skin and more smoothing for the state of mind! It will keep employees focused and healthier in your office space. What about water? Make sure your faucets and toilets are not leaking! Leaking faucets can waste from 700 to 2000 gallons of water, and a toilet can waste up to 25,000 gallons per year. Check all faucets for aerators. These devices that are installed in all newer faucets reduce the amount of flow that come from the spout to reduce waste water. Change the handles out on your toilets to dual flush! These handles can be purchased separately and don’t cost all that much! Are you in a State that can capture and reuse rain water? Prepare now, and do your homework! Get your landscaper on board, and see what uses for gray water systems your site might have! Want to take it up a notch higher? Investigate solar power! Either for a percentage of your building or just for your hot water usage! Use solar powered landscaping lighting for your pathways and main entrance! Provide bicycle parking for those that can commute by two wheels, or encourage carpooling and bus riding! Many cities provide incentives or grant programs for office buildings and homes, and the energy companies have "buy back" programs and other forms of support! Invest time and find a great local solar company that can help you through every step of the process! As much as we get excited about products that are made with recycled content, reuse other products in them, reduce their impact on the environment, new carpet, updated lighting fixtures, and new toilets are not always the best way method to choose. Construction waste is averaged at 20-36% of the overall waste in landfills, according to some States statistics. So we encourage to take smaller steps, and find ways the will help your impact while you are still in your office space. Helping the planet survive becomes a choice to change not only your world but your methods of practice every day! Choose what works best for you!